Place a large mixing bowl on top of another slightly smaller one, filled with ice and cold water (the bottom of the large bowl should touch the ice). Set aside. Put chocolate and water (also sugar and/or liquor if you’re using) in a medium-sized pan and melt the chocolate over medium heat, stirring occasionally. Pour the melted chocolate into the mixing bowl sitting on top of ice and water, and start whisking with a wire whisk (or an electrical hand-held mixer) until thick. Watch the texture as you whip and make sure not to over-whip as it will make the mousse grainy. 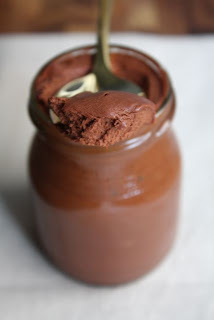 If the mousse becomes grainy (which is possible at your first try), transfer it back into the pan, reheat until half of it is melted, pour it back to the mixing bowl and whisk again briefly. Divide into four serving cups and serve immediately.